Represented clients in permitting numerous projects or contested cases before the North Dakota Public Service for pipelines - coal mines - electric transmission lines and wind farms. Preparation of complex title opinions - including multi-well acquisition projects. Brian R. Bjella is Senior Counsel in the firm’s Bozeman Energy, Environment & Natural Resources Department. 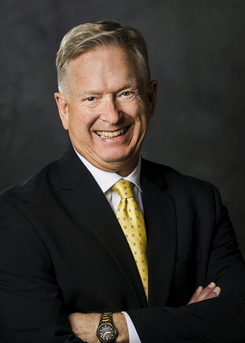 He joined the firm in 2009 after practicing with Fleck, Mather & Strutz, Ltd., in Bismarck, North Dakota since 1980. His primary areas of practice are natural resources, public utilities and government relations law. A significant portion of Brian’s practice involves representing energy clients in permitting facilities before the North Dakota Public Service Commission. He has extensive experience in preparation of mineral title opinions. Brian has litigated contract and property law issues before state and federal courts. He also has represented clients in lobbying activities before the North Dakota legislature. Brian is a board member and treasurer of the Lignite Energy Council, a coal industry trade association. He has been very active in the Rocky Mountain Mineral Law Foundation, serving on the Special Institutes Committee and as chair of the Long Range Planning Committee, several program committees and presenting papers at annual or special institutes. He has been appointed a trustee of the Foundation on two occasions, and twice been elected to serve on the board of directors. Prior to joining the firm, Brian served as an Assistant Attorney General representing the North Dakota Department of Trust Lands. Brian is committed to civic involvement. He has served or is serving on the following charitable boards: the Child’s Hope Learning Center, a preschool for special needs children; United Way, having served as campaign chair in 1997, Board President in 1999 and on the board of trustees; President of the Tom and Frances Leach Foundation, a private foundation granting funds for charitable purposes; the Board of Trustees of the YMCA; and Board of Directors of Luther Seminary. Brian has also been active in the Chamber of Commerce, serving as the government relations committee chair for the 1997 legislative session, and currently on the major employers committee. Hild v. Johnson, 723 N.W.2d 389 (ND 2006); Duncan Energy Co. v. Three Affiliated Tribes, 27 F.3d 1294 (8th Cir. 1994); Coteau Properties Co. v. Oster, 606 N.W.2d 876 (ND 2000); Burk v. Nance Petroleum. Corp., 10 F.3d 539 (8th Cir. 1993); Dakota Resource Council v. N.D. Public Service Commission, 815 N.W.2d 286 (ND 2012); McLain v. Meier, 637 F.2d 1159 (8th Cir. 1980).